Professionally Setup and Loaded with Features! Thinking about starting a new blog or website? Need to start over and do it RIGHT? Move your existing content to a world class Wordpress set up? Want to start an additional blog or website for a hobby or business? Would you like expert, professional help FOR FREE? I’ve been blogging and building websites for over 15 years and doing graphic design for 25+ years. I personally created and developed my own sites like Linky Tools, Linky Followers, Linky Blog, Brent Riggs, Riggs Design Works and Serious Faith (as well as commercial sites like ICML, Marcums and APS). It takes a long time to learn the tools, technical skills, and the trial/error lessons that come with building a high-quality online business or blog. People constantly ask me to assist them and I love to help them get started (or start over) the RIGHT WAY with a blog or website. I’ve decided the best way to help everyone is simply to set it up… and give it away for FREE! Yes, free. Are you one of those maverick go-getters? Ready to get started NOW? First, click here to get your hosting set up… I’ve partnered with Arvixe (who hosts all Linky sites and blogs) to get your free blog. All you need to do is sign up for hosting. You’ll be able to get a new domain name (web address) or transfer your existing domain name when you sign up. (you get a FREE one with your hosting) to use temporarily on the new hosting while you get it set up. You can have multiple domain names pointing to the same blog. When finished with Step 1, click here to send me the details about your hosting that I need to get your blog set up. Arvixe will send you all the hosting information details in an email. IF YOU WERE REFERRED BY ANOTHER BLOG OR PERSON, YOU’LL NOTE THAT REFERRAL IN THIS STEP. When I am finished setting up your blog (usually within the hour), I will send you an email with instructions on how to log in and get started on your new blog! Why am I doing all this for FREE? What’s the catch? I want you to sign up at Linky Blog and be part of our audience. And I make some commission on the WordPress hosting at Arvixe… it’s really that simple (if you have hosting already, no worries, I talk about that below). Building an audience is important to growing a successful blog, and if you’ll be part of my audience at Linky Blog, you’ll get the free blog along with the other great free stuff you already get for signing up… not to mention over 200 fantastic blogging tips!. Let’s recap: if you will sign up and visit Linky Blog once in a while, I’ll give you a free WordPress blog or website that I have personally set up, configured, and LOADED with all the things I use on my own stuff. 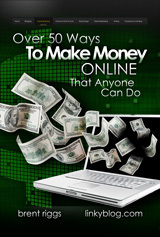 I’ll also give you a couple of great eBooks, and over 200 world class blogging and online business tips… all FREE. Before I tell you everything you get for free, let me tell you what this is NOT meant to be… I’m creating you the foundation of your blog or website. It’s already for you to add your logo, graphics, contents, etc. This is not a free service to become your “web guy” where I create content, migrate existing content, do your custom graphics etc. Look at it like this: I’m building you a house for free, and it’s all ready for you to come in and paint, decorate and landscape. I’m saving you several days of set up hassle, hundreds of dollars in software and services costs, and giving you a jump start with a decade or more of my experience. 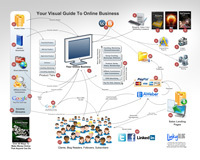 But it’s then up to YOU to add your logo, content, images, information, etc. The latest version of WordPress, installed, configured and set up the way I would do it if I were creating one for myself! Backup and security features already installed, configured, and ready to use. WordPress settings and configurations already done. Sample categories set up and ready to use. My suggested menu and navigation set up and ready to go. My suggested widgets already installed and configured. Twenty of my favorite themes for you to choose from (a license for most of them would cost you $39 or more); these are full featured, high quality themes! You can choose from thousands of others available online. My “must have” plugins, tools and features installed, setup and ready to use: Security, Pinterest, Backups, Duplicate/Clone Posts, Forms, Comments, Web Statistics, Images, Likes, Spelling and Grammar, Sharing, Social Media, Shortcodes, Extra Widgets, SEO, Advanced Editing, Surveys. 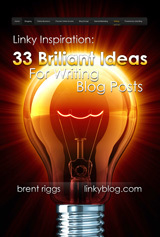 Thirty-three sample blog posts and ideas to help jump-start your writing! Optin Skins – add gorgeous forms and social sharing to your blog in seconds. The best optin form tool available. A license would cost you $67 but I provide one for you. WP Touch Pro – turns your blog into a mobile version automatically! This “pro” version is incredible. A license would cost you $49 but I provide a license for you. Already activated is my absolute favorite, flexible theme that I think you are going to love! Create beautiful and unique layouts visually, without touching a single line of code. The builder gives anyone the ability to create truly dynamic websites with ease. Eighteen pre-made layouts that allow you to quickly jump-start your design. These are completely customizable and can be used as a great starting point for creating your own designs. Wonderfully responsive no matter how you choose to configure your website. Each and every building block will conform to your visitor’s screen, creating the most intuitive browsing experience. A selection of the pages you need, all created, set up and ready for you to customize such as a contact form, “New Visitors Start Here,” and About pages. That’s $155.00 saved just in license purchases alone for some must have software! If you are going to move an EXISTING domain URL, consider getting another domain name (you get a FREE one with your hosting) to use temporarily on the new hosting while you get it set up. And keep in mind… this is YOUR blog/website. You own it. It’s 100% (and easily) customizable! You have total control to change things, add stuff, or configure it differently than I have done. But trust me, at a minimum I have saved you many hours (days?) of installing, configuring and setting up what I consider the “must have” stuff for a blog (assuming you know what to install in the first place). 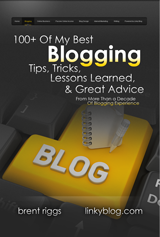 If you are new to blogging or websites, this is your lucky day, believe me! If you are experienced and just need to start over, or start a new one, this will still save you a tone of hours and expense. Most of this setup stuff has to be learned the hard way through trial and error. Unfortunately, there are a lot of “experts” out there giving bad or inexperienced advice, making it even harder to get a new blog set up the right way. If you are wanting to start over, or migrate from Blogger to WordPress, this free blog is just what you need to get a huge jump start! First, you don’t want “free” hosting from services like WordPress.com because they all come with too many limitations you’ll end up regretting. Linky Blog has partnered with Arvixe to give you state-of-the-art, full-featured, world-class, WordPress-optimized hosting for only $4/month. You can’t hardly get a cup of coffee or a hamburger for four bucks. Arvixe hosts everything that Linky Blog and “Brent Riggs” does including all my client websites. They are a GREAT company. While I’m thrilled about doing all the work for FREE (set up your blog, configure it, install all the tools, set up your pages, get things rolling for you), I can’t afford to pay $4/month for thousands of free blogs. That’s like giving away free cars and then paying for a lifetime of gas too! You don’t pay me anything for the blog set up work or the free licensed software… my part is free, but you do need to get the $4/month hosting with Arvixe to get your free blog. If you hang around with Arvixe for a while, I eventually get a one-time commission on your hosting (I just want to be up front about that – otherwise known as “affiliate sales,” something you need to learn about too!). Why Arvixe? Because that is what Linky Blog uses and it allows me to quickly and reliably get your blog set up and ready to go PRONTO. I have all the instructions and information on exactly how to use your blog at Arvixe already written up and ready to send after I get your blog installed, configured, and set up. Many of the features and software are offered by Arvixe as part of their hosting. Already have hosting? I’ll set this on your WordPress hosting account with everything included that I’ve listed (even the $155 in licensed professional software) for $74. That is a FRACTION of what you would pay a professional developer. When you consider the $150+ of software license fees I’m including, you end up SAVING money. An INCREDIBLE bargain for $74. I’ve worked really hard to build a certain reputation online: I love to help people, I’m accessible, and I’m a real person just like you. I truly believe that helping other people succeed is the key to our individual success and contentment. I’m looking forward to hearing from you and visiting your blog or online business.